It is important for a CNA to learn how to transfer a patient from the bed to a wheelchair as this is one of the trickiest tasks for a health care worker. It requires a lot of balance and strength from a nursing assistant that they must be able to provide perfectly and comfortably for the patient in order to achieve the best results. Attention to detail and the safety of the patient are of utmost importance about this task. The patient must also be given a chance for their own preferences where applicable and must be provided with a comfortable transfer to the best of the abilities of the CNA. The first step is to knock on the patient’s door and to call their name. The worker must introduce himself or herself to the patient after coming in and should explain to the patient why they are there as well. They must provide the patient with the step-by-step process of how the procedure will be carried out before, during, and after the procedure is done. This will help the patient to become more relaxed and cooperative throughout the process. Next, the CNA then washes his or her hands thoroughly and puts on their personal protective equipment to help prevent the spread of disease and infection. Place the wheelchair alongside the bed near to where the resident will be sitting, then lock the wheels into place. Fold the footrests of the wheelchair so it does not stand in the way when the resident is being transferred. Then, assist the patient to get to a sitting position without having to pull their arms or hands. Let them take some time to orient their body in this new position as some patients may experience nausea or discomfort afterwards. Place a pair of non-slip footwear on the patient’s feet and put their feet flat on the floor. Apply the transfer or gait belt on the resident properly. It should have a gap where you can easily slip your flat hand between the gait belt and the resident, and it must not also come into contact with the patient’s skin for a safer and more comfortable transfer. Make sure that the belt does not catch any fold of the skin. When the patient is comfortable, assist them in standing up by standing in front of the patient and reaching under the arms of the resident in order to grasp the gait belt at the back or at the sides. Brace the resident’s legs and maintain your balance while pulling them up to assist them in standing, turn them towards the wheelchair, and lower them to a sitting position. 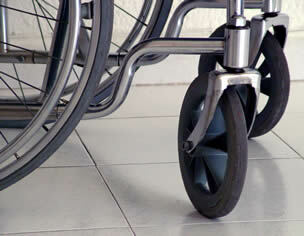 The wheelchair must be placed properly that you will not have to put it nearer to the back of the resident’s leg. Place the resident on an appropriate position, with the hips against the back of the chair and with their feet on the footrests. Remove the gait belt from around the patient’s waist and ask them if they are comfortable. Remove personal protective equipment and proceed to wash your hands.